Channel 8 was there, too, along with a crowd that included Spread the Word staff, board members, volunteers, and staff members from AGS, the company that sponsored this school’s “adoption.” It was all happening to kick off a program that will provide books to every child in the school, all year long. No, not library books. These are books they take home to keep. The proceedings began with an assembly in the school’s auditorium. Lisa Habighorst, Spread the Word’s Co-founder and Executive Director, explained the program and showed the children some of the books they’d be receiving. 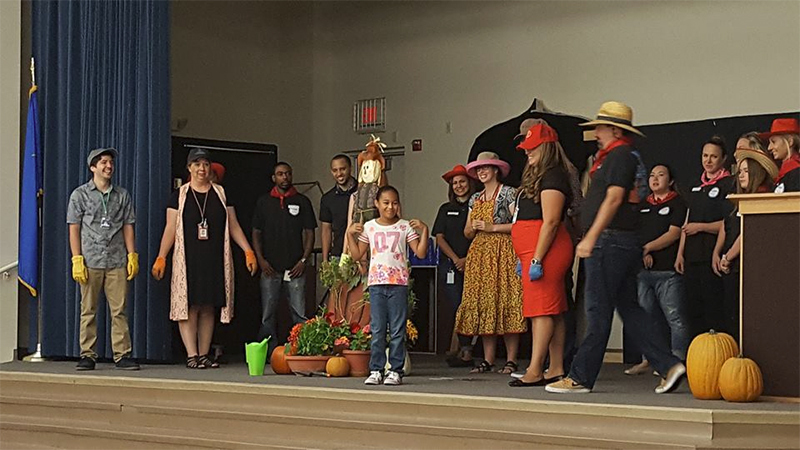 AGS staff and Griffith faculty members dressed up as cowboys and farmers starred in an autumn-themed skit featuring a recalcitrant pumpkin. With the help of a Griffith student, they learned that working together is the best way to get something done. At last it was time for the important stuff. Spread the Word staff members had already set up tables in the school’s outdoor corridors. They were stacked with books, all organized by grade level. 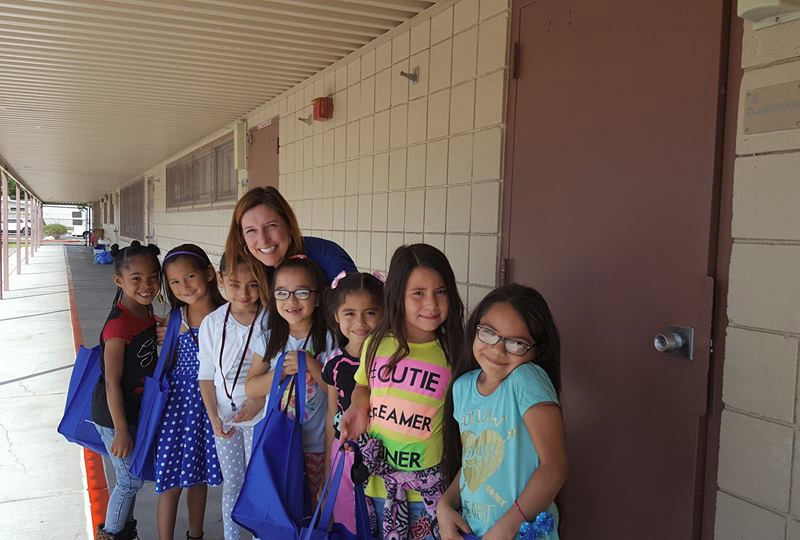 Every child received a book bag already containing two brand-new books. As they passed by the tables, they each chose three more books. Five books! A very nice start to a personal library. I was thrilled to be able to help a few third graders find just the right books, from a beautifully illustrated hardback of Aesop’s fables to a book about fairies and another about sharks. These books might be “gently used,” but because of all the careful work by volunteers to make sure each book is clean and complete, they look like new. And quite a few are new, because Spread the Word raises money to buy books, too. 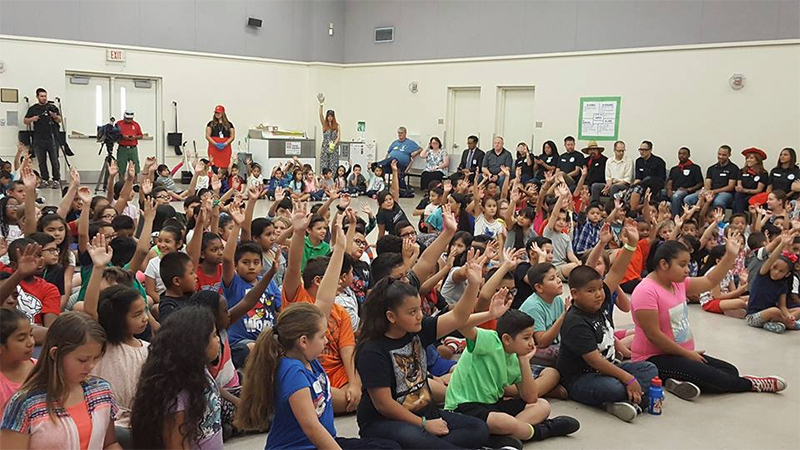 The pictures capture just a bit of the excitement that engulfed Griffith Elementary School last Thursday. And now, once a month, more books will arrive, all year long. That’s what Spread the Word does, here and at 48 other schools in at-risk, low-income communities in Las Vegas. That’s 52,000 books a month, and more than three million since 2001.